< My Result Is "No"
You'll receive support, resources and information about your pregnancy. Pregnancy Tracker based on user data input. < My Result Is "Yes"
You'll receive support, resources and information about how to get pregnant. Introducing the first pregnancy test that syncs with your smartphone and provides access to an app that offers information and post result support for the next 9 months. 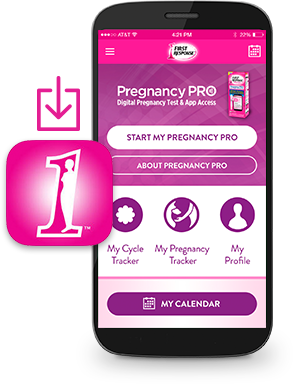 *First Response Pregnancy PRO Digital Pregnancy Test & App Access via mail-in rebate. Valid on purchases made between 6/15/16 and 12/31/16. Rebate form must be mailed and received by 1/31/17. Rebate for purchase price up to $22.00 (tax excluded). See details and full Terms and Conditions for offer FIRSTRSP33 at https://inmarrebates.com/firstresponse/. Unless expressly prohibited by law, payee authorizes reasonable dormancy fees deducted if check not cashed within 180 days. Discover the first-ever pregnancy test to sync with your smartphone. This unique testing experience includes the app that brings you unprecedented post result support for the next 9 months. Because what you need more than anything right now is information. Step-By-Step Test Assurance – The app walks you through the process and tells you time remaining to result. Wait Time Support – The app provides distractions to help reduce stress while waiting. Post Result Support for the Next 9 Months – The app offers tools and information, including suggested next steps. FIRST RESPONSE™ Pregnancy PRO Test provides the information you need in one place. The test gives an accurate result and the app provides resources and support specially designed for your stage of the pregnancy journey. follow the simple steps on how to take the pregnancy test. Search for the First Response™ App and download it at your app store. Read full details and instructions before taking test. Hold stick by Thumb Grip, with the Absorbent Tip pointed down, and the Display Screen facing away from body. Place Absorbent Tip into your urine stream for 5 seconds. Collect urine in clean, dry cup. Dip the entire Absorbent Tip into urine for 5 seconds. While holding stick with Absorbent Tip pointed down, put Overcap back on. Place stick on a flat, dry surface, Display Screen facing up. The clock symbol will begin to blink about 30 seconds after urine is applied. This means the test is working. While you wait, the First Response™ App on your phone will provide entertainment, information and relaxation tools to help keep you occupied and reduce anxiety. 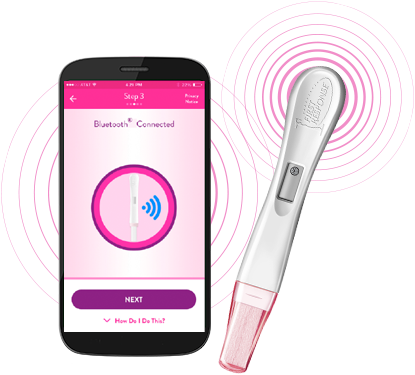 After about 3 minutes, the result will be displayed on the Pregnancy PRO Digital Pregnancy Test Stick and in the App on your device. Some pregnant women may not have detectable amounts of the pregnancy hormone in their urine on the day they use the test. The amount of pregnancy hormone increases as pregnancy progresses. In laboratory testing, FIRST RESPONSE™ detected the pregnancy hormone levels in 60% of pregnant women 5 days before their expected period, in 86% of pregnant women 4 days before their expected period, in 96% of pregnant women 3 days before their expected period, in >99% of pregnant women 2 days before their expected period, in >99% of pregnant women 1 day before their expected period and in >99% of pregnant women on the day of their expected period. PREGNANT: “YES+” shows on the Display Screen. This means that the pregnancy hormone (hCG) was detected. Please see your healthcare professional to confirm this result. NOT PREGNANT: “NO-” shows on the Display Screen. This means no pregnancy hormone (hCG) was detected at this time. Your unmistakable result will also be displayed in words on your smartphone screen. The App will also provide you with information & post result support for the next 9 months and coupons based on your result. CAUTION: You may not be pregnant, or it may be too early to tell. If you do not get your period within 7 days, you should retest with another FIRST RESPONSE™ Pregnancy PRO Digital Test. It is possible that you miscalculated the length of your cycle or your urine may not have had enough pregnancy hormone for the test to register a “YES+” result. If upon retesting you get another “NO-” result and your period has still not started, you should call your doctor. 2 FIRST RESPONSE™ detects the pregnancy hormone 6 days sooner than the day of your missed period (5 days before day of expected period) See individual product pages for Things to Know about Testing Early. 3 >99% accurate at detecting typical pregnancy hormone levels. Note that hormone levels vary. App screens are for demonstration purposes only, copy and imagery may vary. Results display on test stick and phone. Estimated due date requires user data input. Only your doctor can determine your due date based on your complete medical condition. The Bluetooth® word mark and logos are registered trademarks owned by Bluetooth SIG, Inc. and any use of such marks by Church & Dwight Co., Inc. is under license. Other trademarks and trade names are those of their respective owners. What should I do if I receive the result on the test stick, but not through the App? The Test stick remains your primary delivery vehicle for your test results. If results do not appear in the App, please contact customer service at the number below. If an error occurs with the test, will I still see the result in the App on my phone? A “?” symbol indicates an error has occurred during testing. If this occurs, you will receive an error in the App as well. You should retest with another FIRST RESPONSE™ Pregnancy PRO Digital Pregnancy Test, carefully following all directions or contact customer service at the number below. The Display Screen is blank. Will I still see the result in the First Response Planner PRO App? If the display screen goes blank at any time before yielding a result, an error has occurred. Please contact customer service at the number below. What happens if an error occurs with the App? What happens if the battery on my smart device dies before I get my results through the App? The test stick remains your primary delivery vehicle for your test results. However, in order to access your Personalized Action Plan delivered with your results through the App, charge your phone and then reconnect your test stick to the App by following instructions on the App screen. I've clicked "Connect" and there is no device found? Go to ‘Settings’ on your mobile device and turn on the ‘Bluetooth’ setting. I've entered my passcode, but I only see a spinning circle on the App screen and the results are not displayed. If your results do not display after several moments, close out of the App completely and restart it. If you continue to have issues, please contact customer service at the number below. The App froze when I was taking the test. If the App freezes during the test, close out of the App completely and restart it. Then follow the instructions on your screen to reconnect your test stick to the App in order to access your Personalized Action Plan delivered with your result. 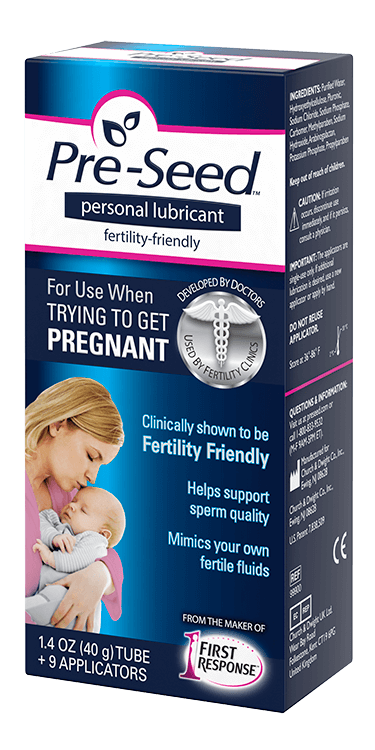 The FIRST RESPONSE™ Pregnancy PRO Digital Pregnancy Test detects in urine the hormone your body produces during pregnancy; human chorionic gonadotropin (hCG). When can I test with FIRST RESPONSE™ Pregnancy PRO Digital Pregnancy Test? 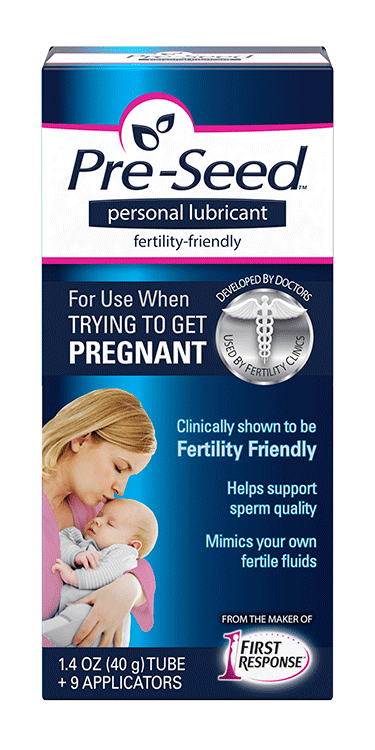 FIRST RESPONSE™ Pregnancy PRO is >99% accurate from the day of the expected period in laboratory studies. However, some pregnant women may not have detectable amounts of pregnancy hormone in their urine on the day they test or may have miscalculated the first day of their period. What do I do if the result on the Display Screen is “YES+” (pregnant)? A “YES+” test result shows that the pregnancy hormone (hCG) was detected, which normally indicates pregnancy. You must see your doctor to confirm that you are pregnant. If you test positive, but think you may not be pregnant, you should check with your doctor. What do I do if the result on the Display Screen is “NO-” (not pregnant)? You may not be pregnant, or it may be too early to tell. If you do not get your period within 7 days, you should retest with another FIRST RESPONSE™ Pregnancy PRO Digital Pregnancy Test. It is possible that you miscalculated the length of your cycle or your urine may not have had enough pregnancy hormone for the test to register a “YES+” result. If upon retesting you get another “NO-” result and your period has still not started, you should call your doctor. The blinking clock has disappeared followed by a “?” on the Display Screen. What does this mean? A “?” symbol indicates an error has occurred during testing. You should retest with another FIRST RESPONSE™ Pregnancy PRO Digital Pregnancy Test, carefully following all directions. If the display goes blank at any time before yielding a result, an error has occurred. Please call customer service at the number below. Your result will be displayed for at least 30 minutes. Read your results within this time frame. Once you have read your result, discard the stick. Note: This device contains a battery with a removal feature on the reverse side of the Thumb Grip. Be sure to dispose of the battery according to local regulations. Some splashing while using the test will not damage the test, but if it becomes very wet it can become damaged. If the test becomes damaged, the Display Screen will either go blank or an error “?” message will appear. Only medications containing the pregnancy hormone (hCG) can affect the result (for example, A.P.L.4, Pregnyl5, Profasi6 and Pergonal6). The test should not be affected by hormone therapies containing Clomiphene citrate (for example Clomid7 and Serophene8), alcohol, pain killers, antibiotics, or the contraceptive pill. 4 A.P.L. is a trademark of Wyeth-Ayerst Laboratories Division of American Home Products Corp.
5 Pregnyl is a trademark of Organon, Inc.
6 Profasi and Pergonal are trademarks of Ares Trading SA. 7 Clomid is a trademark of Merrell Pharmaceutical. 8 Serophene is a trademark of Serono Laboratories, Inc.
2 FIRST RESPONSE™ detects the pregnancy hormone 6 days sooner than the day of your missed period (5 days before the day of expected period). See individual product pages for Things to Know about Testing Early. Read the First Response Pregnancy Pro App U.S. Privacy Notice. If you have any questions call us, toll-free at 1-800-367-6022, Monday-Friday from 7:00 AM to 5:00 PM Eastern Time.